Hi guys. Today I have a preview for you. The GLAM Polish Welcome to Storybrooke Collection will be available for purchase tonight (if you're in the US) at www.glampolish.com.au. 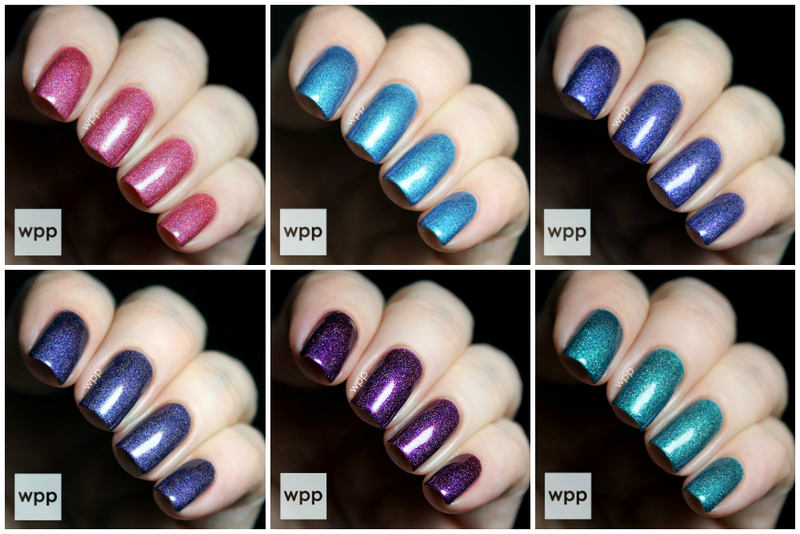 This beautiful, nine-piece release includes vampy holos inspired by the ABC TV show, Once Upon a Time. The series is set in the fictional town of Storybrooke, whose residents are characters from fairy tales who've been transported to "real life". I've never seen the show...but I'm intrigued! I have six of the nine polishes to show you and every single one is gorgeous. Desperate Souls is a deep purple holo. You can't see the green shimmer in my swatch, but it's there. Very pretty. This one is practically a one-coater, but I used two here. Red-Handed is a pinky-red holo with a strong shimmer. My swatch is two coats. Stunning. Into The Deep is a medium sky blue. This one has the least holo effect of the six I'm showing you, but it's still pretty blingy. Next up is Fruit of the Poisonous Tree, also a purple, but with a beautiful red shimmer. This one could also be a one-coater. Amazing, right? A Land Without Magic is a teal green holo with iridescent micro glitter and shimmer. I love this shade of green and the glimmery effect is awesome. And last, but not least, is Second Star to the Right. This blue-leaning purple holo includes red, violet and blue glass flecks. This is two coats. I didn't want to take it off! The three additional shades: Hat Trick; Selfless, Brave & True; and The Thing You Love Most are limited edition, multi-chrome, holos. (You can see swatches at the GLAM Polish website). All six had a creamy, smooth formula and were a breeze to apply. It's tough to pick a favorite, but if I could only get one, it would be Second Star from the Right. This shade of purple is absolutely gorgeous. The GLAM Polish Welcome to Storybrooke Collection will go on sale October 14th, at approximately 7pm EST (9am AEST, 15 October) for $11.95 each. Polish ships to the USA for $7.95 for the first polish and $1.00 for each additional polish. Shop at www.glampolish.com.au and follow GLAM Polish on Facebook, Instagram and Twitter too!